Mostly known these days as an author and teacher, Maya Angelou died in late May of this year. Her death at the age of 86 was widely noted and mourned, and social media was briefly inundated with lines from her work and her most quotable quotes. In future centuries when historians want to depict the changing social and creative landscape of the twentieth century United States, they would do well to focus on Angelou. 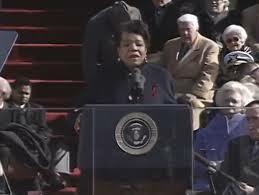 At the time of her death on that May morning, Maya Angelou was still participating in both public and private events. When looking at her biography, most of us will feel we haven’t done anything with our lives. 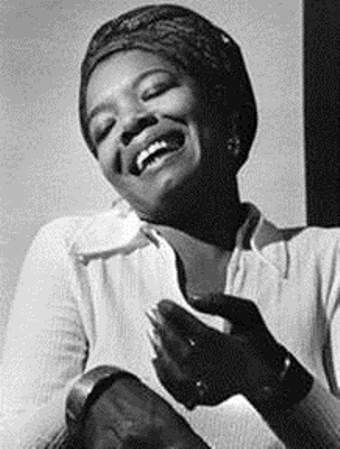 Before her bestselling autobiographical I Know Why the Caged Bird Sings was published in 1969, she had worked as a streetcar conductor in San Francisco, magazine editor in Egypt, public official in Ghana, a dancer anda singer – and single mother. She was also associated with the Civil Rights movement in the United States and counted both Martin Luther King and Malcolm X in her circle of friends. Afterwards she was known as a prolific author, working in television and movies as well as poetry and “autobiographical fiction”, discovered Oprah Winfrey, and recited one of her poems at Bill Clinton’s First Inauguration in 1993. For years she was on the faculty of Wake Forest University and was prominent on the lecture circuit. For her chaotic early life, including being raped and her subsequent elective mutism for five years, I’ll let the reader pursue these matters on her or his own. It is clear that Angelou (she was born as Marguerite Annie Johnson) is one of those individuals who encountered great adversity, especially early in life, and from that developed both wisdom and a strong sense of humanity as well as a confidence in her own accomplishment. I hope the psychologists spend years studying her and others like her. In the meantime we have her astrological chart and here it is. She was not the Mercurial personality as was Yeats but had a prominent “solar” ingredient. We see Leo rising, governed by Sun exalted in Aries conjunct Jupiter. At its worst a solar person is self-absorbed, in the middle is appealing and charismatic but a little too much, and at its best is genuinely heroic. 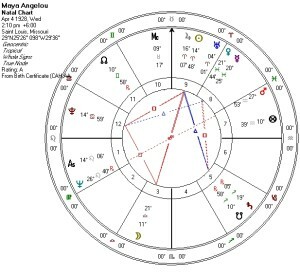 The Sun position in Angelou’s chart has strength and visibility as well as an adventurous and inspired nature. Yet to be effective the Sun needs to be accompanied by other prominent factors. We can look at the trines to the Sun and Jupiter from Saturn in Sagittarius; as with Yeats, Saturn has contributed focus and the ability to work hard – enough for her to accomplish by midweek what would take the rest of us months. It’s not hard to see Saturn as a wholly positive factor in her chart and in her life. We continue with the Moon in Libra. We know about Libra’s affability and sensitivity to context, especially in contrast to the strong motivation and restlessness inherent in a strong Aries Sun. Moon’s dispositor is an exalted Venus in Pisces but Saturn also has a strong role to play. The elephant-in-the-living-room is, of course, that the Moon and Sun and Jupiter are all in square to Pluto, and some astrologers would talk about a T-Square with Pluto at the apex and the Sun/Jupiter-Moon at the base. I see this simply as the Moon applying to a square to Pluto and to the Sun simultaneously, similar to Yeats’ Moon applying to Sun and Saturn at the same time. In the 12th it’s hard not to note a role in Angelou’s early childhood with its skeletons-in-the-closet that she wrote about compellingly during her lifetime. Pluto also provides strong determination (especially when involved with Sun and Jupiter) and desire to live life as meaningfully as possible, not as a victim of circumstances – even if she was victimized by her life’s circumstances. For somebody as dynamic as Angelou, the only angular visible planet is Mars in the 7th in Aquarius. Mars is oriental but out of sect in her diurnal chart and has a disturbing opposition from Neptune. As the dispositor of Sun and Jupiter in Aries, and in the same sign as both her Lot of Fortune and Spirit, Mars is critical. Placed in the 7th, I can write about a turbulent love life (like Yeats) with many errors of judgment (the opposition from Neptune). We can note a possibility toward becoming a victim, one that was not to be the case with her. We can also look at its dispositor that is also the ruler of the Lots of Fortune and Spirit – Saturn, once again: the melancholy planet points to her self-discipline and a strong (maybe grim) sense of purpose. Maya Angelou at Bill Clinton’s inauguration in 1992. Saturn also has a role to play in Angelou’s Mercury and Venus placements in Pisces that are in square to Saturn. Mercury and Venus are in the difficult 8th house that the ancients called “idle” because its sign is disconnected to that of the Ascendant. 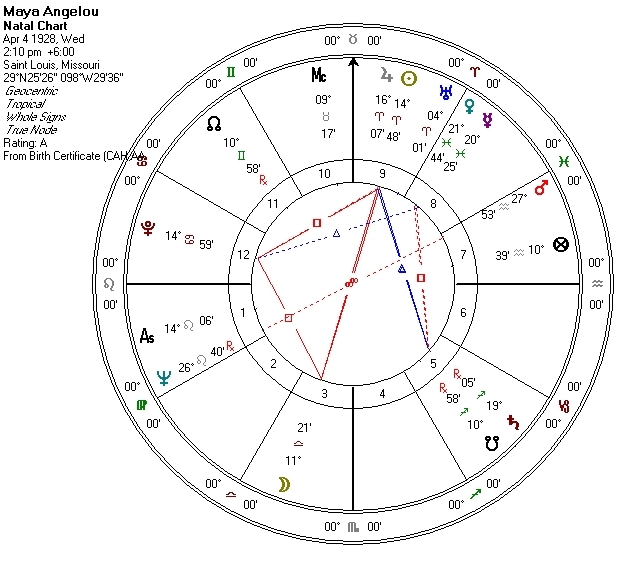 Unlike Yeats’ prominently well-placed Mercury in Gemini, Angelou’s Mercury is in detriment and fall. Mercury is in sect, oriental in her diurnal chart – that helps a little, I guess. Fortunately Venus, highly dignified in Pisces, is right next to Mercury, giving her a strong aesthetic sense if not the verbal agility or expressive range that we see with Yeats. This combination of a debilitated Mercury in square to Saturn makes me think of her five years of elective mutism when young. Interestingly, Angelou subsequently wrote that those five years gave her a greater chance to see the world and to listen to people and became a source of her later creative life. Maya Angelou had two abilities that made her different from many people. She was able to approach personal tragedy and adversity fully, not taking refuge in denial, dissociation, or rationalization. She was also able to see how her individual experiences, as unique as they have been, did not differentiate her from others but provided a common language and subjectivity, and that would help be her creative gift to the times in which she lived.